Thursday night marked the ninth annual MacBowl, a charity event co-sponsored by Macworld magazine and Other World Computing (OWC). The event gathered Macworld Expo vendors under one roof for a good cause: Raising money for an at-risk San Francisco school to create a Mac-based computer lab for their students. From left, Macworld editorial director Jason Snell, OWC President Larry O'Connor, and Starr King Elementary School Principal Chris Rosenberg. This year participants raised $14,500 in cash and product donations for the Starr King Elementary School, located in southeast San Francisco’s Potrero Hill neighborhood. 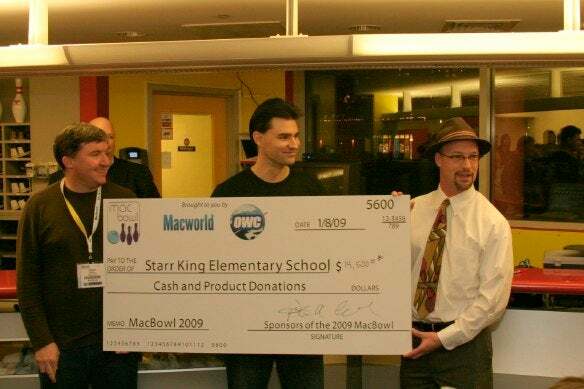 Principal Chris Rosenberg was on-hand with other Starr King staff and several students to accept a check presented by Macworld editorial director Jason Snell and OWC President Larry O’Connor. The MacBowl is in its ninth year. Over the past decade, Macworld and the event’s other sponsors and participants have been able to raise a total of $184,500 in cash and product and equipment donations for schools identified by the administrators of the San Francisco Unified School District as being at risk and in need of up-to-date computer hardware and software for their students. The MacBowl gathers attendees at a party held at the Yerba Buena Lanes, a bowling alley located in the Yerba Buena Center on top of the Moscone Center in San Francisco, right where Macworld Expo is held each January. The beer and soda flows freely and much pizza and fried food is consumed by the assembled throngs of bowlers. Each participating exhibitor sponsors a team to play — their sponsorship money and donation is used for the benefit of the recipient school. In addition to Macworld and OWC, which sponsored two teams, this year’s participants included returning champions Microsoft, which also sponsored two teams, Freeverse Software, Smith Micro and Roxio. Although Elgato was unable to send a team to play, they kindly returned as sponsors as well — and Freeverse brought enough personnel to bowl in their stead. OWC and Microsoft — both comprising teams of very proficient bowlers — were the heavily-favored favorites for this events, and in recent years the MacBowl has turned into a good-natured but still fierce rivalry between these two titans of the tenpins. A future Starr King Elementary School student tries her hand at bowling. After the crowds assembled, the check was presented, and plenty of fried food was consumed, it was time to bowl. Each team played two strings; the combined score determined the winner. Coming in last place was Elgato’s proxy team, headed up by Freeverse staffers, with a total score of 602. Close behind them was the Macworld editorial team, which slunk out before their scores were announced — a paltry 763. Smith Micro followed, with a combined score of 903, and Microsoft’s second team offered up a surprisingly poor showing of 933. Freeverse’s official team finished solidly in the middle of the Mac with 942, while OWC’s team one limped in at 959. Microsoft’s team one wrapped up with 1024, which caused elation for OWC — their second team finished at 1038. But the surprise of the night came as the Sonic/Roxio team, which won the event with a total score of 1103. To the victors go the spoils, and the winning team claimed their trophy, which will remain in their care until next year’s MacBowl at Macworld Expo in 2010.